City Hall Plaza transforms into a winter wonderland with a vibrant holiday market, a fun skating path, a wine sampling tent, performances, and festive cheer throughout. 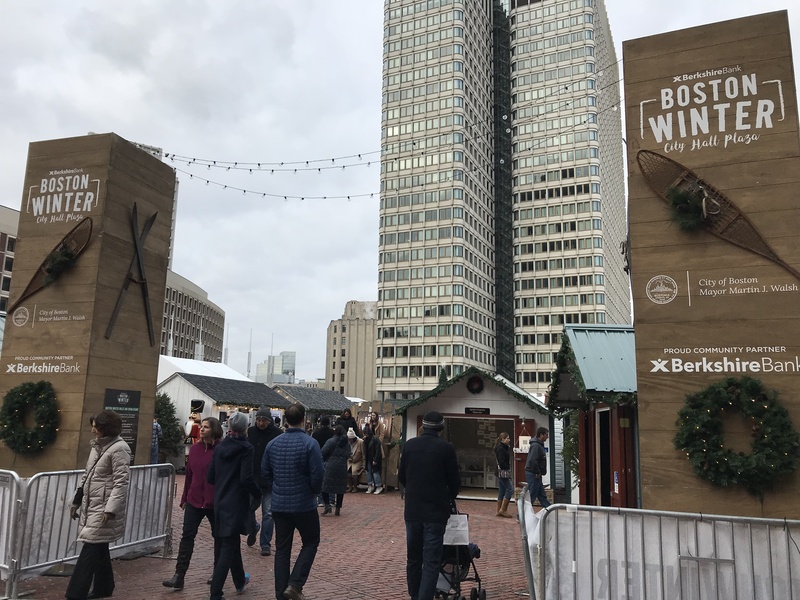 Right in the heart of Boston at City Hall Plaza, Boston Winter is a fun destination when the temperatures dip and holiday cheer is in the air. It comprises a Holiday Market, a skating path, and a stage for live performances. In its second incarnation, the 2017 Boston Winter is bigger and better. The success of the inaugural market drew a larger number and variety of vendors to this year’s Holiday Market. More than 80 vendors from near and far have set up shop in festive wooden chalets adorned with wreaths and garlands. Sharing space in the aptly named “Little Shop of Cute” are three local artists, Migration Goods, Zooguu, and SepiaLepus. Over at the Paper Chase chalet are a group of illustrators and printmakers – showcasing fun and hoard-worthy (yes, I know this is supposed to be the gift-giving season…) stationery, prints, totes, and ornaments. There is plenty to check out – chalets selling maps and prints (we love Rusty and Ingrid), Boston sports gear (check out that print of Bill Belichick), lovely-smelling personal care products (Brothers Artisan Oil, Urban Kitchen), jewelry (Recycled Glass by Carolina is affordable fun), cold weather accessories, Christmas ornaments, and much much more. Chocoidea from Germany (their first stop and first time in the U.S.) proved highly popular with young and old alike. The chocolate trains, tractors, shoes, Hello Kitties, and flowers have intricate detail but what wowed shoppers most were the nuts, washers, and bolts that assemble like the real thing. You can even employ a chocolate wrench to screw/unscrew the assembly. They also make chocolate scissors, pliers, faucets, and clamps that will surely elicit appreciation and a chuckle from the handy person in your life. The popular skating path has been reconfigured for a fresh experience. The Zamboni dressed as an MBTA Green Line train is a hoot. 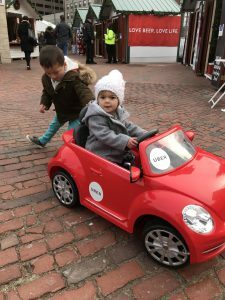 As parents to toddlers who need to be distracted while we shop, we appreciated kid-friendly features such as the Santa House, the Enchanted Castle Experience which has a chocolate tasting area, Letters to Santa, various props for cute family pics (sleigh, snowmen, toy soldiers, a giant adirondack chair), an Uber branded mini car, plus live performances at the Berkshire Community Stage. At night the market is sparkling with lights, wine tasting gets into full swing, adults get to sip alcoholic beverages at the Enchanted Castle Experience, and instead of Santa, you can choose to write letters to the President, which then get mailed to Washington. The Holiday Market will be open until December 31st. 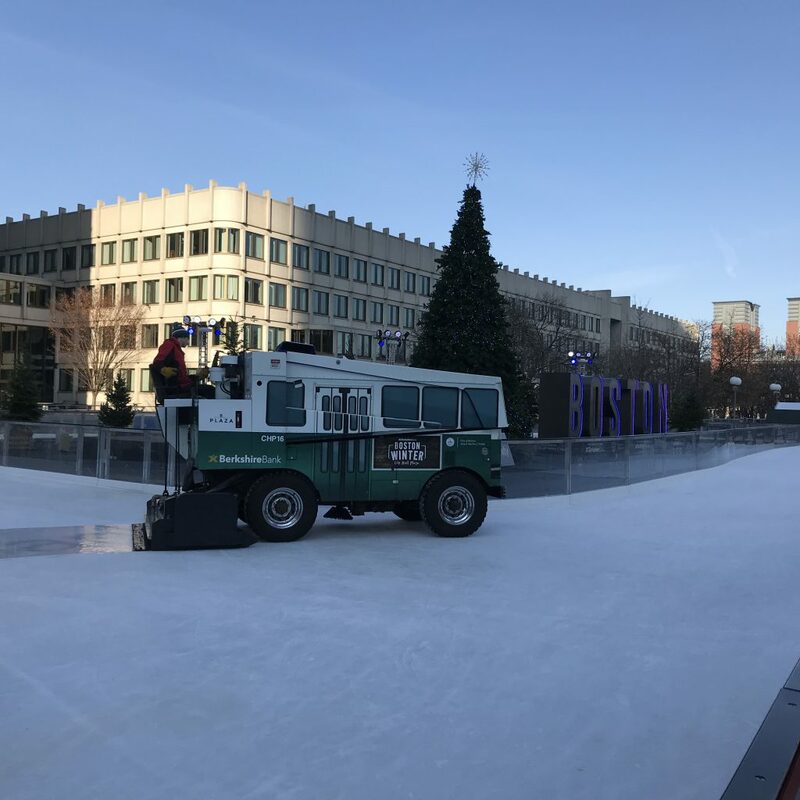 The skating path will remain open until February 25th.